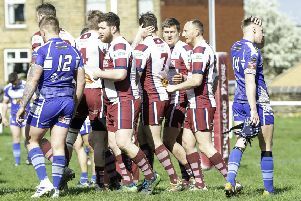 Cleckheaton produced a superb display to maintain their 100 per cent home record with an impressive 20-17 success over Sale. Victory saw the Moorenders produce the perfect start to 2015, while denting Sale’s hopes of winning the National Three North title. Cleck produced a display of commitment and passion as they dished up a great game in front of a healthy crowd. The first half-hour of the match was locked in stalemate and it was Sale who opened the scoring when a kick to the in-goal area looked to have been grounded by Jack Bickerdike but Chris Mayor dived on the ball and was awarded a try, which Liam McGovern converted. Ross Hayden reduced the gap with a penalty goal and Cleckheaton enjoyed a spell of sustained pressure as the half drew to a close, with Alex Dawson going close. Cleckheaton’s defensive efforts had almost nullified Sale’s attack in the first half but McGovern kicked a penalty and the visitors led 10-3 at the break. Michael Piper had an excellent kicking game to earn Cleckheaon’s man-of-the-match and he reduced the arrears with a drop goal. Cleckheaton took the game to Sale with Mike Piper’s kicks and good chasing from Martin Woodhead, Cammy Burnhill and Hayden pinning Sale in their own half. Cleckheaton kicked a penalty to the corner but with talisman Richard Piper off the field, it was left for Ben Thrower to claim possession at the back of a 12-man maul that powered over for the try. Hayden added a difficult conversion to give the Moorenders a 13-10 lead. Attempts by Sale to hit back were met by solid defence and frustrations led to a yellow card for McGovern. Ollie Akroyd gathered another line-out close to the line and a second 12-man maul was formed for a second time which ended with Rob Afoa Peterson getting the ball down and Hayden again converting a yard from the touchline. Sale threw everything at Cleckheaton but Carl Mason and Josh White added fresh legs, with Paul Turner and Callum Thompson also superb. A minute from time, Sale got a try to give their sizeable following hope but despite the visitors attempting to keep the final play alive, Cleck were awarded a penalty, which Mike Piper kicked into touch to seal a memorable victory.